// Creating the Tasks collection in this way enables data binding from XAML. That stuff is pretty standard. but in the XAML I have three columns in the datagrid, and for each column I'm bringing in my user control "textFilterControl"
It just adds a filter button on the column heading that uses a context menu to actually display the filter options. In the user control there is a apply button which then adds to the filter for the view. for now my filter is just doing a if contains, once I get it working ill add to the filter to match all the options my user control has. 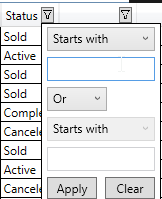 Everything is working except when I try to filter off multiple columns. I believe this is because the filter method in the user control is the same name even if it is a different instance. to verify I copied my user control and change the name of it and when I applied a filter to the two columns (each one using a different copy of the control control) the filtering worked as expected. I am looking for some ideas or suggestions on how to get this working. the idea here was to have the filtering all in the user control so I could just reuse it whenever I needed it. I felt like I was so close. Please Help. Browse other questions tagged c# wpf user-controls autofilter or ask your own question.